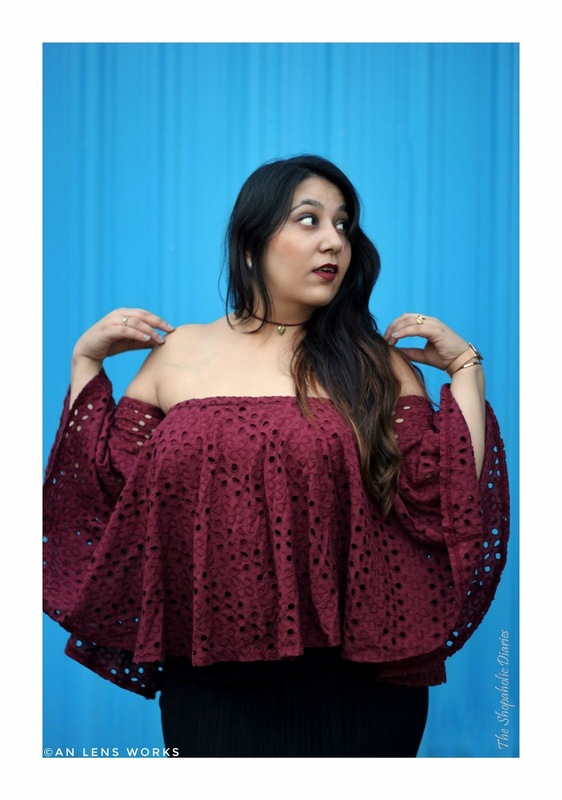 OOTD - For the Love of Off - The - Shoulder | How to Style an Off-Shoulder Top | The Shopaholic Diaries - Indian Fashion, Shopping and Lifestyle Blog ! Winter is finally here but I ain't saying goodbye to off-shoulder tops just yet. 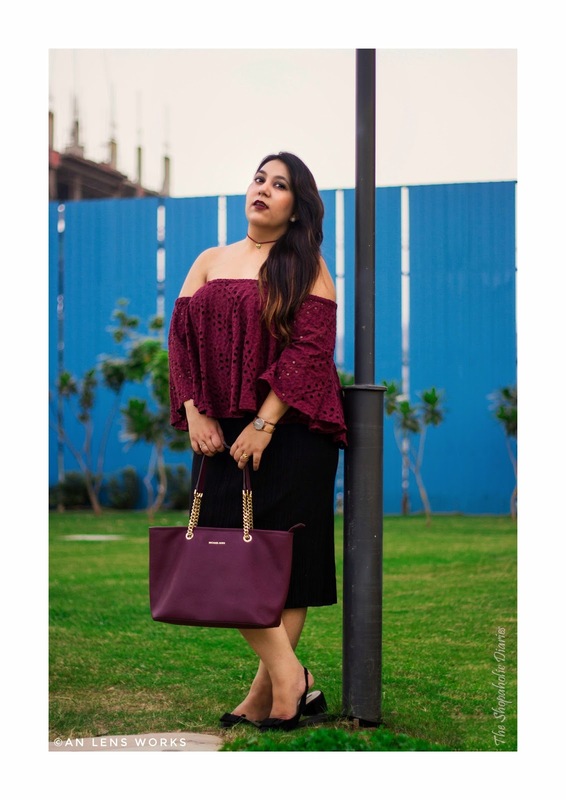 Well, off-the-shoulder tops have been my preferred style of dressy tops since long, but this season - I have been loving them all the more as a lot of brands have introduced this style with interesting sleeves to slay and minimal vibes. That's why, when I saw this pretty wine-colored top from Ridress online, I couldn't stop myself from buying it. From it's schiffli embroidery to the flared sleeves - this top makes dressing up for parties and dinner outings a lot easier. For an evening out with my girls, I styled it with a black pencil skirt - my wardrobe staple from Zara and paired the outfit with my low-key Zara sling-back heels. 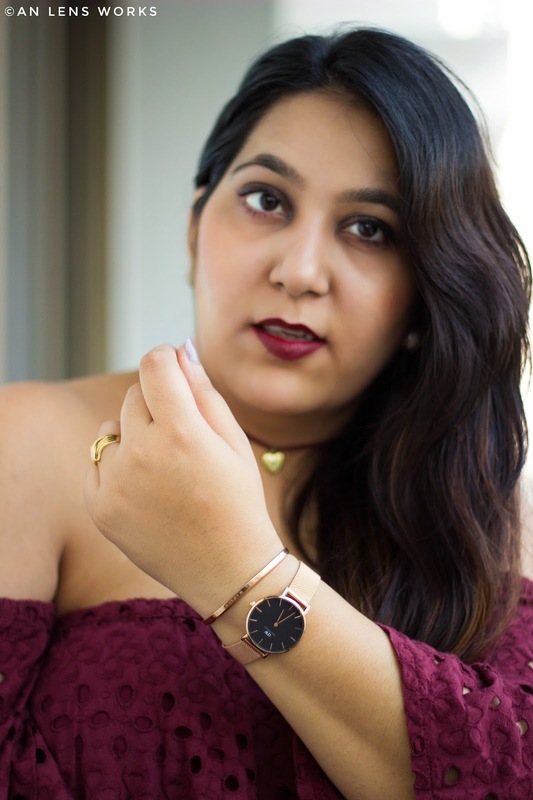 To complete the dressy look, I wore a sleek watch from Daniel Wellington and picked my Michael Kors shoulder bag which is an absolute beauty with its trendy chain handles and structured look. Pick a style you feel the most comfortable in, as you won't want to be caught pulling your top up every time you step out. If off-shoulder isn't your thing, go for a boat neck top or a top with thin straps that will give a cool yet comfortable look. You can pair your off-shoulder top with boyfriend jeans or jeggings as well for a day look; and add a pair of sneakers for a chic vibe. Make sure you have the right lingerie to wear underneath your off-shoulder top, or it can really spoil the entire look. Go for a strapless bra with no seams for a smooth look. For winters, you can also pick an off-shoulder sweater or a loose pullover that you can wear off one-shoulder for a trendy look. You can also wear a trendy choker or neck piece to glam up your look; or wear dangler earrings that fall on your shoulders. What's your favorite trend this season? Let me know your views about this outfit in the Comments below!